Is New Years in the Bible? When is the Biblical New Year? Is New years in the bible? When Roman Emperor Julius Caesar declared January 1 as the world’s New Year’s day based on a duplicitous deity, the connection could not have been more apropos. 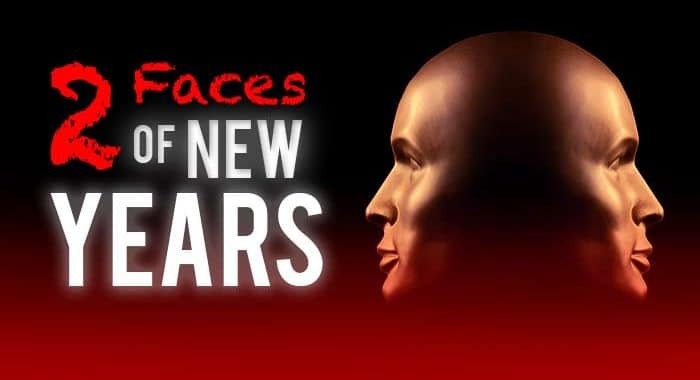 Specifically, the god he worshiped was two-faced, a fitting metaphor of the flip-flopping that marked New Year’s day through the centuries. Caesar’s idol was named Janus, from which we get our month January. The emperor thought his deity would be the suitable portal to the new year, as one of his faces looked forward to a new year, the other backward. That’s the sanitized version of New Years. The messy and convoluted history of the January 1 New Year’s observance reveals chronological confusion amid political intrigue, race hatred, and fuzzy math—all in an attempt to improve upon the Biblical calendar as inspired by our Creator. The January 1st new year is an on-and-off tradition. Surprisingly, January 1 has been celebrated as a holiday by Western nations for only about the past 400 years. The earliest record of a new year celebration is believed to have been in Mesopotamia, c. 2000 B.C.E., and was celebrated around the time of the vernal equinox in mid-March. A variety of other dates tied to the seasons were also used by various ancient cultures. The Egyptians, Phoenicians, and Persians began their new year with the fall equinox, and the Greeks celebrated it at the winter solstice. The early Roman calendar designated March 1 as the new year. The calendar had just ten months, beginning with March. That is why the name September means seventh in Latin but is actually the ninth month. October means eight but is actually the 10th. November means 9th but is the 11th. December means 10th but is the 12th month of the secular year. The first time the new year was celebrated on January 1st in Rome was in 153 B.C.E. In fact, the month of January did not even exist until around 700 B.C.E., when the second king of Rome, Numa Pontilius, added the months of January and February. February was the end of the year, making the new year a spring event. The new year was moved from March to January because that was the beginning of the civil year, the month that the two newly elected Roman consuls—the highest officials in the Roman republic—began their one-year tenure. But this new year date was not always strictly and widely observed, and the new year was still sometimes celebrated on March 1. In 46 B.C. E. Julius Caesar introduced a new, solar-based calendar. The old calendar had become out of sync over the years. This new Julian calendar began the new year with January 1. Within the Roman world, January 1 would become the consistently observed start of the new year. Sacrifices were made to Janus, gifts and visits were exchanged, along with masquerading and feasting. Not everyone found this observance acceptable. The early Catholic Church condemned the festivities as paganism. “Participation in the ordinary New Year’s Day observances as well as in the Saturnalia of December was from the first discouraged by the Church. Christians were expected to spend the day in quiet meditation, reading of Scripture and acts of charity” (Encyclopaedia Britannica, 11th Ed., Vol. 19, p. 594). During the Middle Ages, the Church remained opposed to celebrating New Years. 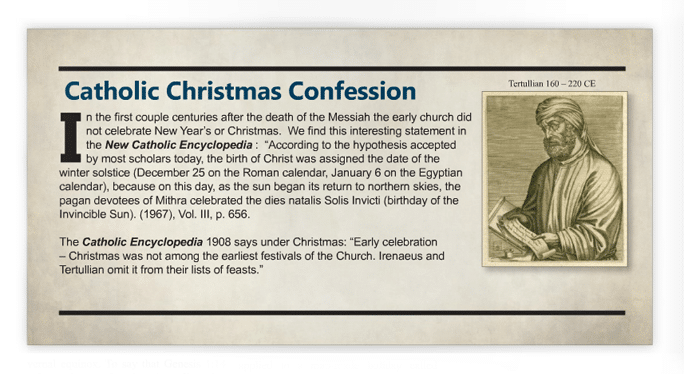 But as Christianity became more widespread, the early church began melding its religious observances and dates with other pagan celebrations of the day, and New Year’s Day was no exception. New Years is still observed as the Feast of the Savior’s Circumcision by a few modern denominations. In 567 the Council of Tours abolished January 1 as the beginning of the year. At various times and in various places throughout medieval Christian Europe, the new year was celebrated on December 25; March 1; March 25 (the Feast of the Annunciation, when the Angel Gabriel announced to Mary she would have a divine Son); and Easter. March 25 was the usual date among Christians in early medieval days. After William the Conqueror became King of England on December 25, 1066, he decreed that the English return to the January 1 new year established by the Roman pagans. This move ensured that the commemoration of the Messiah’s supposed January 1 circumcision would align with William’s coronation, thus tying the English and Christian calendars and his own coronation into one neat bundle. William’s innovation was eventually rejected, and England rejoined the rest of the Christian world and returned to celebrating New Years Day on March 25. In 1582, Pope Gregory’s calendar reform restored January 1 as new year’s day and synchronized the seasons with the months, which had gotten far out of harmony. This is still the calendar in use today. Although most Catholic countries adopted the Gregorian calendar almost immediately it was only gradually accepted among Protestant countries. The British, for example, did not adopt the reformed calendar until 1752. Until then, the British Empire — and their American colonies — still celebrated the new year in late March or early April. The giving and receiving of gifts at New Year’s has an ancient past. The Persians exchanged eggs at the beginning of the year. Gift exchanging at New Year’s is a custom strong in Europe. “The Druids distributed as New Year’s gifts branches of the sacred mistletoe. In Anglo-Saxon and Norman England New Year’s gifts were common, ”Britannica. Roman pagans found a different method of observance— drunken orgies—a ritual they believed constituted a personal re-enacting of the chaotic world that existed before the cosmos was put in order by the gods. However, gift-giving was not always in vogue at the new year observance. Sometimes bloodletting was more the case. Julius Caesar celebrated his first January 1 New Year by ordering the violent routing of revolutionary Jewish forces in the Galilee. At the 1577 New Year’s inauguration of the second great Roman calendar (Gregorian) Pope Gregory decreed that all Roman Jews, under pain of death, must listen attentively to a compulsory Catholic conversion sermon given in Roman synagogues after Friday night services. On New Year’s Day 1578 Gregory signed into law a tax forcing Jews to pay for the support of a “House of Conversion” to convert Jews to Christianity. On New Year’s 1581 Gregory ordered his troops to confiscate all sacred literature from the Roman Jewish community. Thousands of Jews were murdered in the campaign. Throughout the medieval and post-medieval periods, January 1 was reserved for anti-Jewish activities: synagogue and book burnings, public tortures, and murder. The true Biblical calendar is based on the growing season, with the first month called Abib, which is rooted in the green barley grain. This calendar eliminates the need to perpetually adjust month lengths, add leap years and intercalate a 13th month in order to synchronize the lunar and solar cycles. Here is how Yahweh told us to determine the start of the year: “This month shall be unto you the beginning of months: it shall be the first month of the year to you. In the tenth day of this month they shall take to them every man a lamb…And you shall keep it up until the fourteenth day of the same month: and the whole assembly of the congregation of Israel shall kill it between the evenings.”Exodus 12:2-3, 6. This is the Passover lamb. Which is this first month when the Passover was observed? “Observe the month of Abib, and keep the Passover unto Yahweh your Elohim: for in the month of Abib Yahweh your Elohim brought thee forth out of Egypt by night,” Deuteronomy 16:1. Abib means green ears (of barley). When the barley grain comes to a harvestable age, then you have Abib. No need to juggle solar and lunar cycles, as they take care of themselves under the Bible’s calendar. In Yahweh’s calendar, the first day of the year was observed by watching for the first visible crescent of the Abib moon. This “new moon” starts every month (moonth). Most secular and some religious calendars base their new year on the vernal equinox. The vernal equinox is that instant when the sun is directly above the earth’s equator while going from the south to the north (for the northern hemisphere). It is the time that most believe starts spring. Those who employ the vernal equinox point to Genesis 1:14, claiming that the sun, moon, and stars set the Feasts. It is true that the sun divides day from night and establishes the seasons, while the new moon sets the beginning of months. Yet, nowhere in the entire Bible does the vernal equinox establish Abib. Nowhere in the Bible is there even any mention of the vernal equinox. To say that Genesis 1:14 refers to the vernal equinox is reading what isn’t there. Abib is a condition of grain as much as a time of year. The King James Version has led some astray in the way it translates moed inExodus 13:10, Numbers 9:2, 3, 7, and 13. The KJV uses “season” in these verses, causing some to believe that the command is specifically for springtime, and therefore must involve the vernal equinox. In reality, the Hebrew moed simply means “set time” or “appointed time.” Yahweh has set Passover and the Feast of Unleavened Bread by the criteria of the crops, not by a purely astronomical reckoning known as the vernal equinox. The vast majority of Jews gradually got away from actually looking for the green ears of barley, going instead by a calculated calendar that involved the vernal equinox. This was done for the sake of convenience. 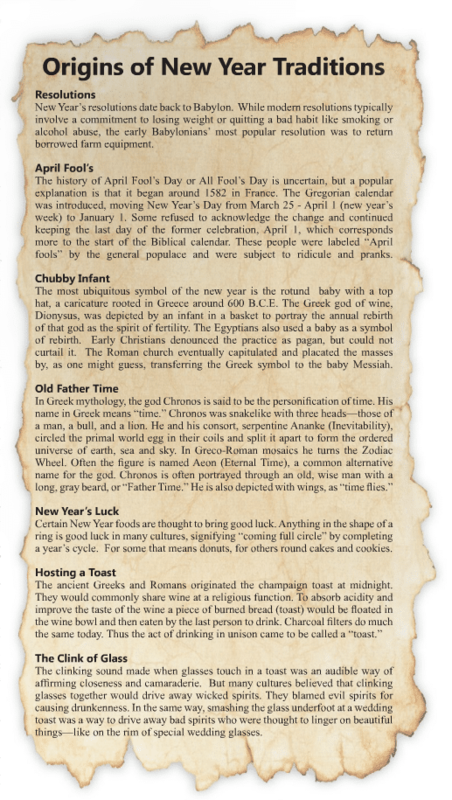 But Yahweh tells us that His growing cycle reveals the proper month for His Feasts. When the Roman church deliberately acted to separate Easter from Passover, it ruled in 325 C.E. in the Council of Nicaea that Easter would fall on the first Sunday after the first full moon following the vernal equinox. This setting of an observance was entirely man-made and appropriately applied to a man-made holiday called Easter. The Roman church on its own volition, therefore, bestowed a legitimacy to the vernal equinox as a calendar marker where it had none before — at least not in any kind of Biblical context. Among heathens, it was a different story. • “Easter, too, celebrates the victory of a god of light (J-sus) over darkness (death), so it makes sense to place it at this season. Ironically, the name ‘Easter’ was taken from the name of a Teutonic lunar Goddess, Eostre (from whence we also get the name of the female hormone, estrogen). Her chief symbols were the bunny (both for fertility and because her worshipers saw a hare in the full moon) and the egg (symbolic of the cosmic egg of creation), images which Christians have been hard pressed to explain. Her holiday, the Eostara, was held on the Vernal Equinox Full Moon. Needless to say, the old and accepted folk name for the Vernal Equinox is ‘Lady Day.’ Christians sometimes insist that the title is in honor of Mary and her Annunciation, but Pagans will smile knowingly.” – Lady Day: The Vernal Equinox, by Mike Nichols. • “The vernal equinox has long been a significant event in the lives of agricultural peoples as it symbolizes nature’s regeneration, fertility, growth and bounty. The word equinox comes from Latin and means “equal night” (German Tag und Nachtgleiche). On this day, night and day each last twelve hours. The Vernal Equinox used to be considered the beginning of the Pagan New Year. It was a time of joy called forth by the resurrection of the ‘Light of the World’ (sun god) from the underworld of the winter, from where he arose to join his goddess Eostre.”– by Ruth Reichmann, Max Kade German-American Center, Indiana University-Purdue University, Indianapolis. • “Modern Pagans also celebrate the universal principle of Resurrection at the Equinox – which is named for Eostre, a Pagan goddess. She is the goddess of Spring to whom the offerings of cake and colored eggs were made at the Vernal Equinox. Rabbits, especially white ones, were sacred to her, and she was believed to take the form of a rabbit. She is also said to be the goddess of the East, that being the direction of rebirth. Since the sun rises in the East, she is linked with the sunrise. Traditional Easter services stem from this association.” Ibid. “Easter is supposed to be derived from Anglo-Saxon Eostre, the name of the Norse goddess whose festival is celebrated by the pagans at the vernal equinox.” – A Book About the Bible, George Stimpson, p. 180. The secular New Year’s observance is significant beyond a collection of quaint, heathen customs. Scripture records Yahweh’s displeasure whenever anyone fiddled with His holy calendar to devise different observances. The coming Beast of Daniel 7 is an unsettling case in point. This individual, who will pose as the true Messiah, will be empowered by Satan himself. Note especially his actions: “And he shall speak great words against the most high and shall wear out the saints of the most High, and think to change times and laws: and they shall be given into his hand until a time and times and the dividing of time,” v. 25. This anti messiah will enforce his own calendar on the world, making his own celebrations that honor only himself exclusively. The world is already accustomed to alternate days of worship. His actions will prove to be the definitive calendar crime of all time and he will pay eternally.